Summary: Cerebral blood flow and metabolism may be uncoupled in the early phases after stroke onset. Prior reports of bilateral thalamic stroke have described subsequent coupling of blood flow and metabolism during the chronic stage. We chronicled the evolving relationship of blood flow and metabolism with concomitant single photon emission CT and positron emission tomography from the subacute to chronic phase following bilateral thalamic infarction. Cerebral blood flow and metabolism may be uncoupled during a period of luxury perfusion in acute and subacute stroke. Early recanalization of an occluded artery may provide inappropriately robust blood flow to the ischemic territory with a generally diminished metabolic demand. Such non-nutritional blood flow typically subsides with evolving infarction, yet ultimately viable tissue within the ischemic bed may be sustained. 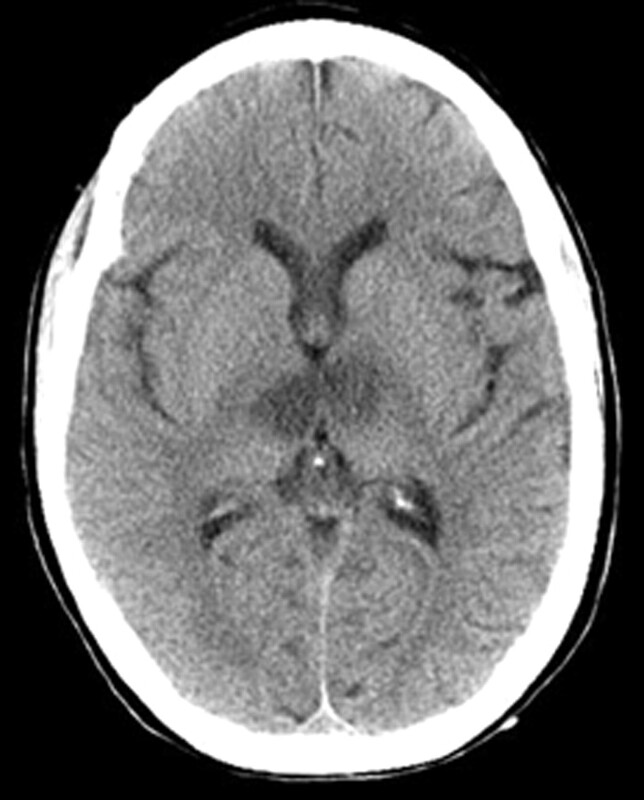 Most radiologic descriptions of bilateral thalamic infarction emphasize the structural injury resulting from ischemia in the distal basilar or paramedian artery distribution (1–3). Physiological imaging studies of this unusual stroke syndrome have demonstrated diminished blood flow and metabolism during chronic stages. We describe the novel use of concomitant single photon emission CT (SPECT) and positron emission tomography (PET) to chronicle the evolution of changes in blood flow and metabolism with concomitant SPECT and PET from the early subacute to chronic phase of bilateral thalamic stroke. A 35-year-old woman with a medical history significant for congenital heart disease with transposition of her great vessels and a Blalock-Taussig shunt, atrial arrhythmia, cardiac pacemaker, and congestive heart failure was found unresponsive at home after recently discontinuing anticoagulation. On initial presentation, she only withdrew to deep palpation. Laboratory studies performed on admission were normal. Noncontrast CT findings were unremarkable except for a chronic left frontal infarct (Fig 1) and the presence of a cardiac pacemaker precluded MR imaging. 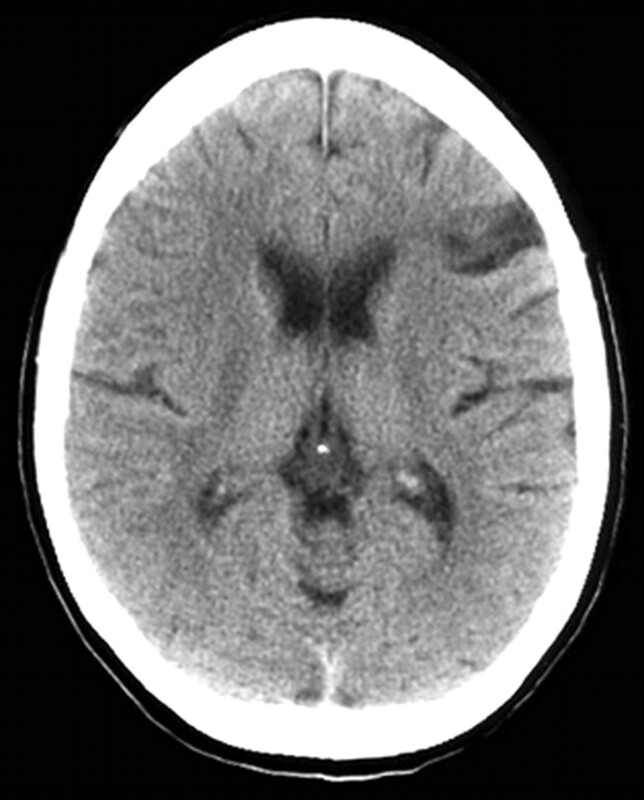 Emergent cerebral angiography showed no evidence of arterial occlusion (Fig 2). Progressive clinical improvement was noted over the next few days and repeat CT demonstrated evolution of bilateral thalamic infarcts (Fig 3). An electroencephalogram revealed prominent frontal intermittent rhythmic delta activity consistent with a deep structural abnormality. Concomitant SPECT and fluorodeoxyglucose (FDG)-PET during the subacute phase demonstrated globally reduced cortical blood flow and normal thalamic perfusion (Fig 4A) with concurrent cortical and thalamic hypometabolism (Fig 4B). She was discharged with neurologic deficits including arousal difficulties, prominent short-term memory loss, left hemineglect, a vertical gaze palsy, right pupillary dilatation, inability to abduct her left eye, and dysarthria. Noncontrast CT on admission reveals a chronic left frontal infarct without acute ischemic changes. 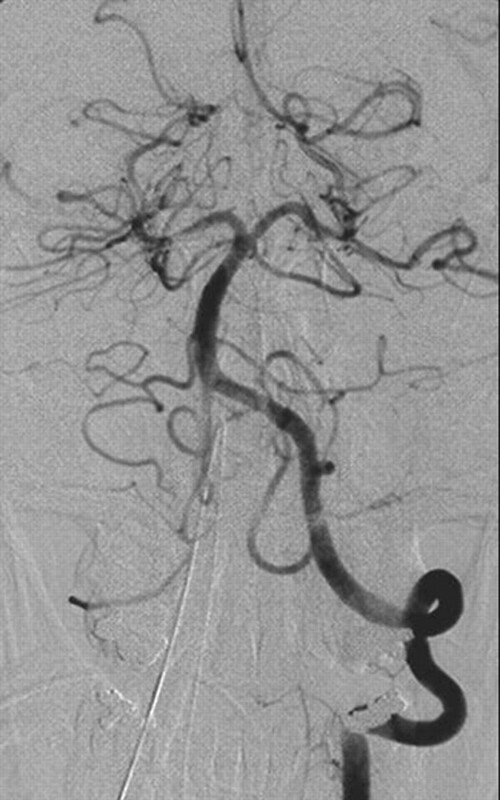 Emergent angiogram of the basilar artery (anteroposterior view) demonstrates absence of arterial occlusion. 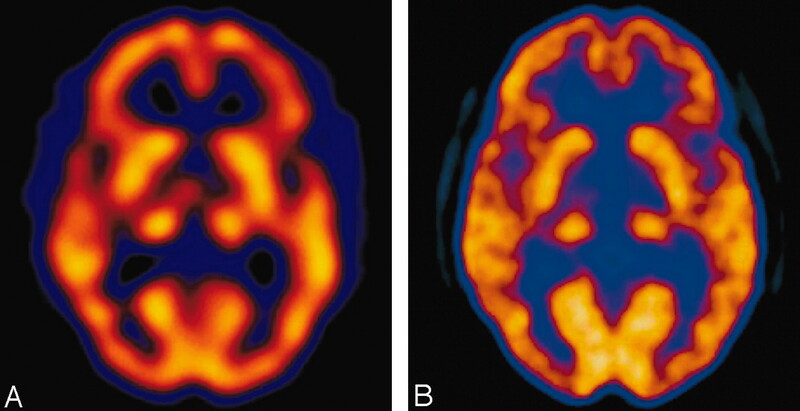 Subacute bilateral paramedian thalamic infarction depicted on noncontrast CT.
Concomitant SPECT (A) and FDG-PET (B) during the subacute phase illustrates thalamic luxury perfusion and cortical diaschisis. Six months from stroke onset, concomitant SPECT and PET images were reacquired. SPECT showed normal perfusion in bilateral thalami and resolution of diffuse cortical hypoperfusion (Fig 5A). PET demonstrated improved cortical and thalamic metabolic activity (Fig 5B). Her residual clinical deficits included only a skew deviation and mild vertical gaze palsy. At 6 months from stroke onset, concomitant SPECT (A) and FDG-PET (B) detail normal thalamic coupling and resolution of diffuse cortical diaschisis. Under normal physiological conditions, cerebral blood flow and metabolism are closely interrelated. Ischemia may lead to uncoupling of perfusion and metabolic demand. Diaschisis, or dysfunction in a remote but interconnected brain region, may also be disclosed by metabolic imaging. Combined effects of uncoupling and diaschisis may be evident in the setting of thalamic ischemia because of involvement of thalamocortical projections. Cortical hypometabolism may result from deafferentiation of abundant thalamocortical fibers that originate from nonspecific regions within the intralaminar, dorsomedial, and parafascicular areas (4, 5). Previous case studies of bilateral paramedian thalamic infarction have examined the relationship between changes in cerebral blood flow and metabolism (6–8). Serial SPECT scans of a single case illustrated luxury perfusion at 1 week followed by reduced thalamic perfusion at 2 months (6). Another SPECT case of bilateral paramedian thalamic stroke noted a similar transition from luxury perfusion to subsequent diminished perfusion at 1 week and 6 months, respectively (7). At later time points into the chronic phase of bilateral paramedian thalamic stroke, persistent thalamic hypoperfusion shown by SPECT has been described (1). Diffuse cortical hypometabolism disclosed using PET has also been described from 40 days to 8 years following bilateral paramedian thalamic infarcts (8). These hypometabolic regions ascribed to cortical diaschisis demonstrated preserved coupling between blood flow and metabolism (8). Our results illustrate uncoupling of cerebral blood flow and metabolism in bilateral paramedian thalamic infarction depicted with concomitant SPECT and PET. The combination of SPECT and PET has not been previously applied in this clinical entity. Thalamic perfusion was mildly increased, despite diminished uptake of FDG-PET activity in this region. Bilateral thalamic perfusion was relatively preserved compared with other deep nuclei despite thalamic hypometabolism. These discordant findings suggest an uncoupling, or a state of luxury perfusion, as evidenced by a relative preservation of thalamic blood flow compared with a reduction in metabolism. Although flow and metabolism may exhibit dynamic fluctuations under normal conditions, these two parameters are typically coupled. As seen in this case, a relative reduction in metabolism despite preserved flow is indicative of uncoupling. Transient thromboembolic occlusion of the basilar artery and paramedian perforators likely recanalized before angiography, whereas ischemic infarction required days to evolve before it was evident on noncontrast CT scans. Cortical hypoperfusion and hypometabolism were noted with concurrent SPECT and PET studies performed in the early subacute period. These findings are consistent with a prior case describing SPECT findings of subacute cortical hypoperfusion (7). Cortical perfusion and metabolism were likely reduced because of involvement of the thalamocortical tracts and associated diaschisis at an early stage following stroke onset. Repeat study with concomitant SPECT and PET at 6 months showed that thalamic perfusion returned to normal levels with improved metabolic activity in bilateral thalami. Such restoration of flow and metabolic coupling likely evolved because of the heterogeneous distribution of ischemic damage in the thalami, allowing for an interval recovery of function. Resolution of cortical hypoperfusion and hypometabolism at 6 months suggests reversal of initial diaschisis. Concurrent SPECT and PET enabled us to study the evolution of early thalamic uncoupling or luxury perfusion and subsequent restoration of coupling. This imaging approach also demonstrated subacute cortical diaschisis with subsequent normalization. Although anatomic and structural imaging was limited to CT because of the presence of a pacemaker, MR imaging may provide further parenchymal details. Concomitant use of SPECT and PET may delineate the temporal relationship between cerebral blood flow and metabolism in stroke. Remote effects of ischemia, such as diaschisis, may also be demonstrated with this approach. Acquisition of concomitant SPECT and PET is relatively impractical in routine clinical practice, yet these combined studies highlight dynamic flow and metabolism changes. Concomitant use of MR imaging in these situations may further delineate differences between anatomical and physiological modalities. Accepted after revision February 27, 2004.